Ford working on CCS for the FFE? Is for working on CCS for the FFE? A couple too many acronyms there? Ok we know FFE = Ford Focus Electric as I’ve been using that in this blog for quite some time now, but CCS? CCS = Combined Charging Standard. It is the “fast charge” capability that SAE (yeah another acronym: Society of Automotive Engineers) had developed for North America. To date Ford has said nothing about any improvements to the FFE. Just a year ago when they announced the 2015 ICE Focus the big news for the FFE was an additional color that was it. Since then Ford has said not so much as a peep about the future of the FFE (or even any possible BEV product). When they announced the 2015 Focus there was rumors that Ford would be including a Focus Energi. That rumor made a lot of sense: They already had the powertrain developed, it is already in a Focus based product (the C-Max), therefore it would take very little engineering to get done. 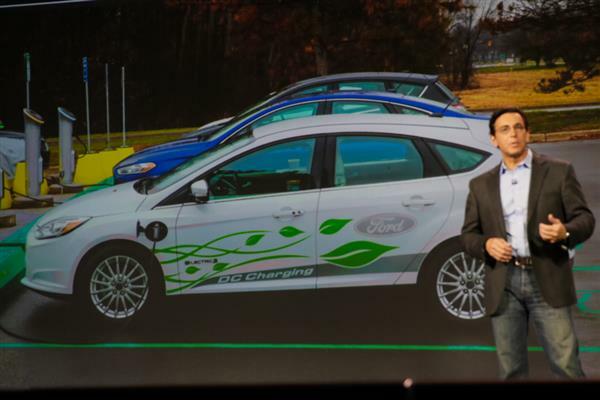 Alas the 2014 auto show circuit came and went with no new news on any electrified Focus (or Ford BEV model). It would also be beneficial if urban shared vehicles were electric. Because not only do they lower operating costs they also can be refueled in their parking space. But shared EVs need time to charge and in Dearborn we are developing fast charging technology for our vehicles. Plus we’re looking at partnerships with retail and fast food businesses to develop fast charging infrastructure. Because we want to make EVs easer to use because when more people chose EVs everyone benefits from the lower emissions. CCS Fast charging doesn’t really make sense for the Energi products with their 21-mile range and small batteries. It only really makes sense for the FFE or another large battery BEV. Thus one could conclude from this small morsel of information that either a CCS enabled FFE is coming down the pipeline, or that Ford is working on another BEV for the marketplace? Will Ford slip in more pieces of info like this at the Detroit Auto show in a week? You’ll have to pay close attention (like I did pulling the above needle out of a haystack)..!